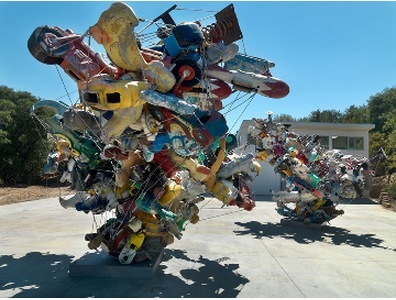 Gagosian is pleased to present “Our Friend Fluid Metal,” Nancy Rubins’ first exhibition of major sculptures in New York since the presentation of Big Pleasure Point by the Public Art Fund at Lincoln Center in 2006. Rubins’ awe-inspiring sculptures are predicated on synthesis, radically articulated mass, and explosive ideas in three dimensions. Geological in scope and metastatic in formation, these rhizomatic structures brim with dark energy, pointing to the inexorable proliferation of manmade refuse. Objects clustered by way of strategic engineering resemble organic reactions; forms mimic living things that grow, mutate, and multiply as defiant growths bursting from tensile constraints, their power enhanced by sheer scale and precarious balance.